Question: How should the church engage culture? Should it seek to transform it? Answer: One of the major conflicts in evangelicalism revolves around the notion of how much the Church should engage culture. Although there is conflict, there are certain things that most traditions agree upon. For instance, there is agreement that the Church should not conform to the idolatrous ways of the world. Yet what exactly those idolatrous ways consist of will vary from tradition to tradition. Also, most traditions will agree that God will restore and redeem creation at the eschaton. Disagreements will arise as to when God begins to restore and redeem creation. Some of these disagreements arise due to some misunderstandings over eachother’s beliefs. 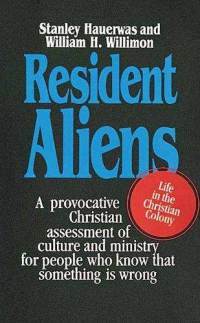 For instance in Resident Aliens: A Provocative Christian Assessment of Culture and Ministry for People Who Know that Something is Wrong Hauerwas and Willimon discuss the differences between Niebuhr’s typology and Yoder’s typology. Hauerwas and Willimon end up advocating for Yoder’s position of the confessing church, the visible church is an alternative polis, being something that the world is not and can never be (46). Its influence lies in it being church rather than actively trying to influence the world. This position is incompatible with Niebuhr’s position, exemplified by F.D. Maurice, this is a view in which the Church can effectively make the world a “better place.” I think that the disagreement between these two positions lies in the lack of allowing the meta-narrative of scripture to influence our views of church and culture. 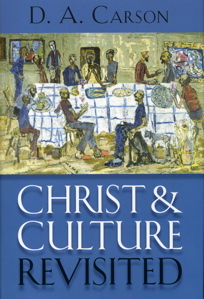 If we take seriously the meta-narrative, as Carson does in Christ and Culture Revisted (Chapter 2), we arrive at a position which sees that the arrogant position that people of the Church itself can change the world (the position advocated by Niebuhr and opposed by Anabaptists), is wrong and misguided. Under the view influenced by the meta-narrative of Scripture (creation, fall, Israel, Jesus, Church, Restoration) we know that the church is still called to love the world because God loves the world, this love for the world will necessarily influence the world and seek to help the people of the world. For instance, the people of the church will help to alleviate the problem of the lack of clean water in Uganda, not because the Church believes that it can solve the problem (the meta-narrative says that certain issues like this cannot be solved before the eschaton) but because the church loves the people of the world. So the church can seek transformation, yet it must realize that complete transformation cannot be attained this side of the eschaton. I picked up this book for cheap on eBay but it’s been sitting on my shelf. Now that I know Niebuhr is involved I’ll have to move it up my list!